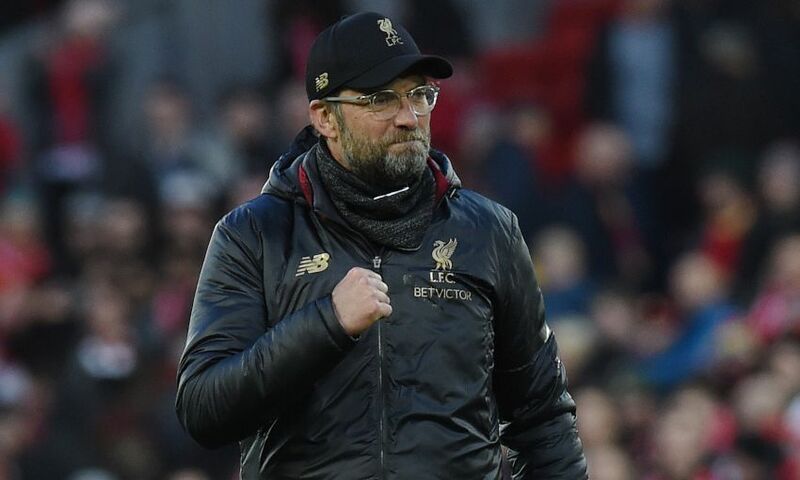 Jürgen Klopp declared himself delighted with the performance of his side as Liverpool returned to winning ways – and the top of the Premier League – with a commanding 3-0 triumph over AFC Bournemouth at Anfield. Mohamed Salah put the seal on a fine afternoon’s work when he swept in at the conclusion of a slick move having been teed up by Roberto Firmino’s sumptuous backheel. It was a result that sent Liverpool three points clear at the division’s summit having played the same number of fixtures as Manchester City in second – and afterwards, Klopp was effusive in his praise for the performance of his players. Not only at the end, the whole game was good. It was a difficult game, we all saw the situations when Bournemouth could play, could use their speed, could use their good offensive organisation. In all the other moments we played a really, really good game. Counter-pressing-wise, it was the best for a while. It was outstanding, which for us is always a sign for a really good game. It was a good moment to get it back. Offensively, it was creative, it was with power and speed, offering runs even if you don’t get the ball. Be a bit wild offensively, force them into difficult situations and use it then. All the goals were brilliant. It was just a really, really good game and a very deserved three points. We are very self-critical. It was clear we were not happy with the two performances. There were always reasons for it. We cannot speak too much about that in public because it sounds like we’re going for excuses. We are not. But the analysis must be sensible, you have to talk about the right things with the boys and we did that. We knew about our situation and we knew we were not happy with our performance in the last two or three games. Still you can win a game or draw it because of different reasons – but we don’t want to come through somehow in the game. We want to play convincing football, we want to perform. That was the reaction we wanted to show today, for us. The boys did that in an outstanding manner and so I’m really happy. That was really, really important. We have to learn a lot and we have to adapt to a lot of situations. It’s not a big problem having three, five or seven points in the lead. It’s not a big thing. But we have to learn. I’m 51, for me it’s not a problem to have my own opinion. I’m not on social media, I don’t read a lot, but of course it’s difficult if everybody is talking about the boys in a special kind [of way]. For us, it’s only important what we think and what we can make better and what we have to improve. That was a very good sign today. We wanted to show a reaction today – that was obvious. We had difficulties before the West Ham game, with Hendo out, Gini out, Millie was not in the team hotel because he was ill but he played. We didn’t perform that well and people were talking about him. Last night, Gini was not in the team hotel because he had pretty much everything you don’t want to have the night or two nights before a game. That’s the news you get in the morning before the last session of the week. Then, after another couple of hours’ sleep he said he felt really good and he thought he could play. But the doc said he is still infectious, so stay away. So I was only concerned today when he scored a goal and everybody gave him a hug, to be honest! I’ve said it a few times and it’s always difficult to talk about that – because people think about why I have to mention it – but these players, the character and mentality of these boys, is the only reason why we are where we are. In moments when you don’t get a result, people doubt that immediately. It’s the world, it’s predictable, but it’s still not true. We can always use the character and attitude of the boys, that’s what we did today. Combined with their outstanding football skills, we can win football games and we will win football games. How many, we will see, but we will try everything. It is the same as you would say about Millie’s character, only nobody spoke about it. I heard some people were very critical of Millie’s performance last week, which is just a joke, to be honest, after all the fantastic games he played. Gini, it was obvious he was very, very good today. That’s how the boys are and that’s brilliant, absolutely brilliant. Hendo trained twice and what the medical department said to him is in the first session you trained with 70 per cent and in the next one with 85. Try to do that! It means not making 100 per cent sprints, but [he said] ‘No, no, it’s all fine, I will do it.’ That’s why we didn’t bring him [in] today because he couldn’t really train. Trent trained twice after four weeks out and it was good that we could bring him [on]. You could see immediately what a fantastic player he is. Today was again a day where the boys were in a shape where they could really show that we can play a little bit of football, so I am really happy for them. The record is really good, but the performance was brilliant. He was pretty much undefendable. It was an outstanding game; it was just exactly the football he is able to play and what we want him to play. Very, very involved in all the things, not only in the scoring moments, in the build-up situations as well. Sometimes dropping a bit, not really deep but in the half-spaces, staying wide and all that stuff. That’s exactly how he has to play and he did it in an outstanding manner. The goal he scored, I don’t think you’ll find a lot of players who do what Bobby did in that moment. Most of them would try to shoot and get blocked, but he did that little, little pass and then Mo is obviously a pretty cool finisher. How can you compare a crowd when you play 1-1 against Leicester and then 3-0 against Bournemouth? That’s just not fair, what do we expect? That they go completely mad in the 1-1 on a snowy pitch where the game is not fantastic football? Where all the circumstances are more for the team with less possession. That’s just not fair. We never spoke about that, we are 100 per cent sure about, and convinced about, our supporters. They are outstanding, they are the other reason why we are where we are, why the home record is like it is. If we had to play in a stadium where it is pretty silent, we cannot play that football. They are all on their toes, they know about the job and they do it and I am really proud of the whole performance today.